After exhausting some of my best patriotic material on last year’s Fourth of July, I had to deliberate considerably on what I should discuss on this year’s Independence Day. Although it steps a bit out of Old Time Blues’ usual prewar milieu, I don’t think I could find a more beautifully patriotic record that better captures what it means to be an American than this 1945 Frank Sinatra classic. This also marks the official debut of my new pre-owned Grado phonograph cartridge (although I’ve updated the audio on some older posts), so the sound should be a little crisper than in the past. Columbia 36886 was recorded in two sessions, the first around 8:45 PM on August 22, 1945, the second around 9:15 PM on August 27, 1945, both in Hollywood, California. On the first date, Axel Stordahl conducts an orchestra made up of Uan Rasey, Leonard Mach, and Bruce Hudson on trumpet, Peter Beilman, Elmer Smithers, and Carl Loeffler on trombone, James Stagliano on French horn, Fred Stulce, Heinie Beau, Don Lodice, Harold Lawson, and Leonard Hartman on reeds, Sam Freed, Jr., Nicholas Pisani, Peter Ellis, Sol Kindler, Mischa Russell, Gerald Joyce, Samuel Cytron, Howard Halbert, David Frisina, Anthony Perrotti, Walter Edelstein, and William Bloom on violins, David Sterkin, Maurice Perlmutter, and Allan Harshman on viola, Cy Bernard, Jack Sewell, and Arthur Kafton on ‘cello, Ann Mason Stockton on harp, Frank Leithner on piano, Perry Botkin on guitar, Jack Ryan on string bass, and Ray Hagan on drums. On the second date, the orchestra is largely the same, except Charles Griffard replaces Rasey on trumpet, Jimmy Skiles replaces Beilman on trombone, John Cave replaces Stagliano on horn, Mannie Gershman replaces Stulce on reeds, Olcott Vail, Victor Arno, and George Kast replace Joyce, Halbert, and Bloom on violin, Garry White replaces Harshman on viola, Fred Goerner and Nicholas Ochi-Albi replace Bernard and Kafton on ‘cello, and Lauretta McFarland, Mark McIntyre, and Dave Barbour replace Stockton, Leithner, and Botkin on harp, piano, and guitar, respectively. In 1945, shortly after the conclusion of the Second World War, the young Frank Sinatra, ever a hit with the bobby soxers, starred in an RKO Radio Pictures short film, written by Albert Maltz and directed by Mervyn LeRoy, titled The House I Live In. In it, Sinatra, taking five from a recording session, breaks up a fight between a group of schoolboys, who are putting the hurt on a peer for being Jewish. Frank steps in and teaches the boys a lesson on tolerance, and what it means to be an American, before singing the titular song. The moving film won an honorary Academy Award and Golden Globe for its excellence, and was in later years inducted into the Library of Congress’ National Film Registry. With music by Earl Robinson and words by Abel Meeropol (under the pen name Lewis Allan), “The House I Live In” made its debut in 1942 as part of the revue Let Freedom Sing, before it came to star in the film of the same name. Although it was written by individuals whose politics would only a few years later gain them McCarthy-era ostracism, I can think of few songs so truthfully and patriotically American as “The House I Live In”. It reflects truly timeless values that are every bit as valid today as they were then. 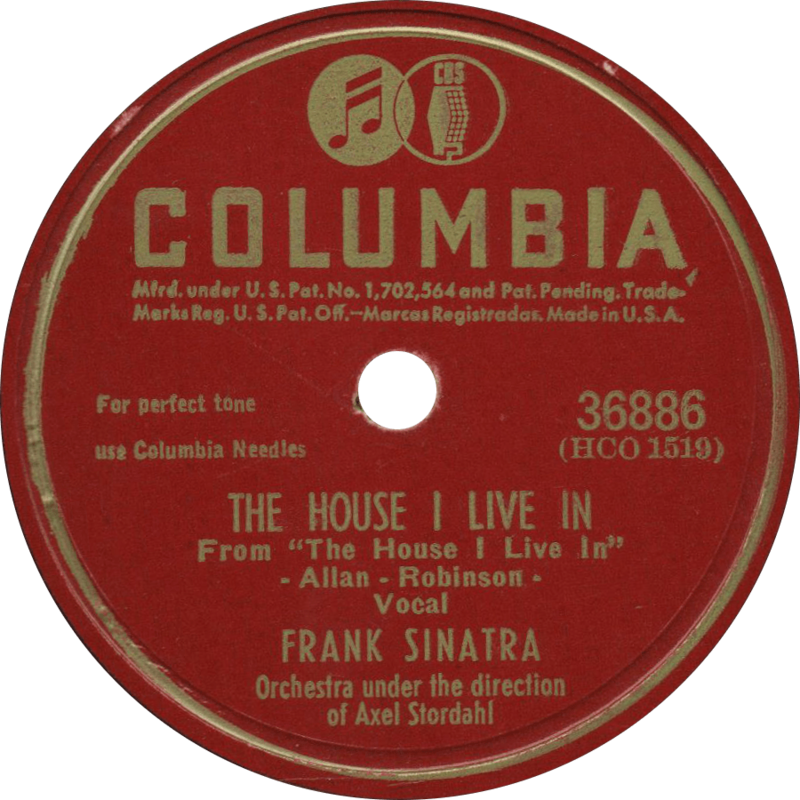 The House I Live In, recorded August 22, 1945 by Frank Sinatra. Maintaining the patriotic theme, on the flip, Sinatra is joined by the Ken Lane Singers for a lovely rendition of “America, the Beautiful”. 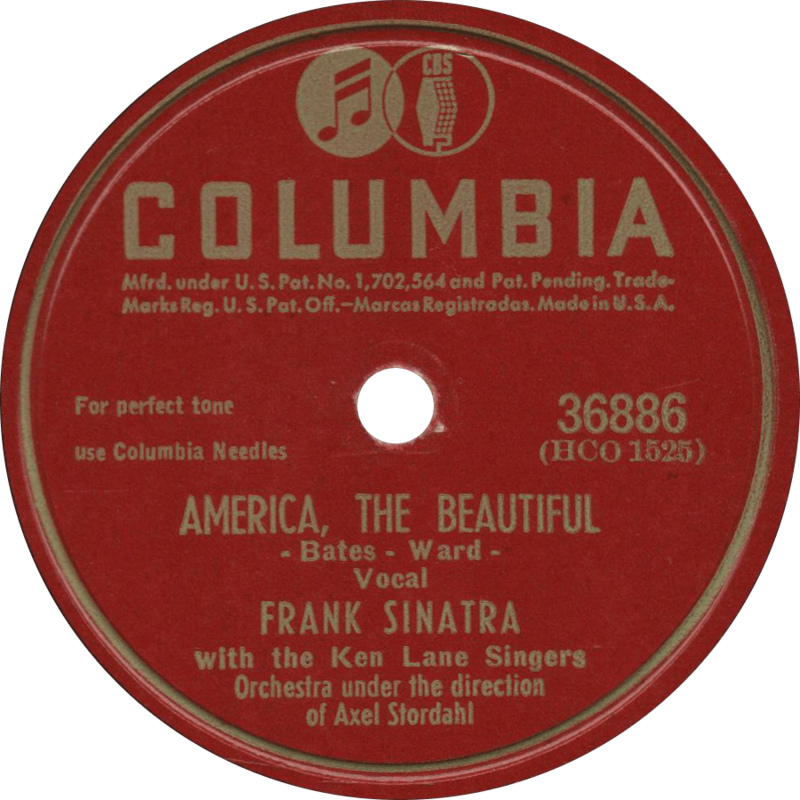 America, the Beautiful, recorded August 27, 1945 by Frank Sinatra. This entry was posted in Records and tagged 1940s, 1945, Abel Meeropol, Allan Harshman, Ann Mason Stockton, Anthony Perrotti, Arthur Kafton, Axel Stordahl, Bruce Hudson, Carl Loeffler, Charles Griffard, Columbia, Cy Bernard, Dave Barbour, David Frisina, David Sterkin, Don Lodice, Earl Robinson, Elmer Smithers, Frank Leithner, Frank Sinatra, Fred Goerner, Fred Stulce, Garry White, George Kast, Gerald Joyce, Harold Lawson, Heinie Beau, Hollywood, Howard Halbert, Jack Sewell, James Stagliano, Jimmy Skiles, John Cave, Ken Lane Singers, Lauretta McFarland, Leonard Hartman, Leonard Mach, Mannie Gershman, Mark McIntyre, Maurice Perlmutter, Mischa Russell, Nicholas Ochi-Albi, Nicholas Pisani, Olcott Vail, Perry Botkin, Peter Beilman, Peter Ellis, Popular, Ray Hagan, Sam Freed Jr., Samuel Cytron, Sol Kindler, Uan Rasey, Victor Arno, Walter Edelstein, William Bloom by R. Connor Montgomery. Bookmark the permalink.